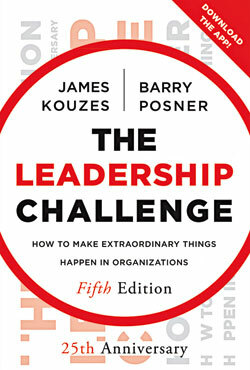 A quarter of a century after it was first published, The Leadership Challenge, by the US academics James Kouzes and Barry Posner, has sold more than two million copies around the world, according to its publisher. The authors' intention is to "liberate the leader in everyone", arguing that the best leaders are those who engage in the "Five Practices of Exemplary Leadership", which form the basis of the book. These begin with "Model the Way", where leaders voice the values of their organisation and make sure their actions live up to them. The self-explanatory second practice is "Inspire a Shared Vision" and the third, "Challenge the Process", refers to the idea that a leader must look to other innovative organisations for inspiration and encourage employees to take risks. The fourth is "Enable Others to Act", which means fostering a culture of trust. The final, cheesily titled practice is "Encourage the Heart". Does this mean you should ask employees to fall in love with each other? Unfortunately not. Rather, it refers to recognising contributions by showing appreciation for individual excellence. What's not to like about that?